Finally, the wait is over. 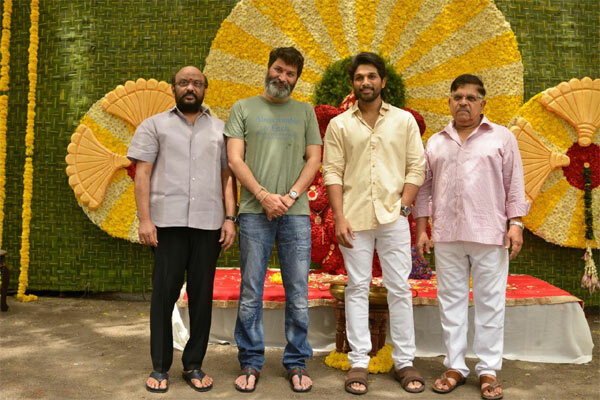 Stylish Star Allu Arjun and Wordsmith Trivikram Srinivas's film has been launched today with a formal pooja ceremony at Ramanaidu Studios in Hyderabad. This is the 3rd time the duo is working together after delivering couple of hits- Julayi and S/O Satyamurthy. The film will be bankrolled jointly under the prestigious production houses of 'Haarika & Haasine Creations' and ‘Geetha Arts’. Slender beauty Pooja Hegde is the leading lady opposite Bunny. The pre-production works for the movie are completed and regular shoot will commence from April 24th in Hyderabad, as informed by producers. Tabu, Satyaraj, Rajendra Prasad, Sunil, Navdeep, Brahmaji, Rao Ramesh, Murali Sharma and Rahul Ramakrishna are the prominent cast while Sushanth makes special appearance. Cinematography will be handled by PS Vinod while S Thaman scores music.